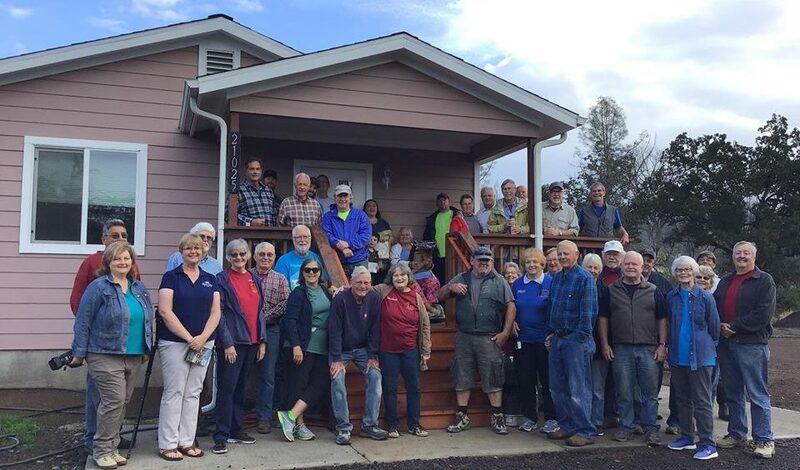 It’s time again for one of our most important stories: Home Dedications. Building a home take time, labor, and after all of that we like to celebrate with the families by welcoming them home with a few special items and, of course, the keys to their new home. When we first start these projects, it can be difficult to see the light at the end of the tunnel, not because we don’t believe they’ll be finished, but because of how much work it takes to get it done. 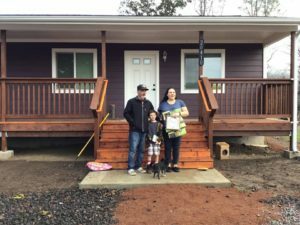 The two homes dedicated this week were built on the same property, Richy and Lorraine and their daughter’s family lived on the property before the Valley Fire and are incredibly happy to be back home. “When we meet families we’re weeping tears of sorrow with them, but on a day like today we’re weeping tears of joy with them,” said Kevin Cox as he started off the dedications. Lorraine and Richy have been evacuated three times in the last year, but they have endured and been patient. 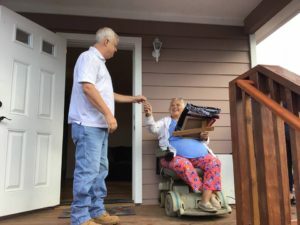 Through all the trials and threat of more wildfires they have seen their home take shape, and at last are able to start fresh. We sat down and talked with Lorraine about the experience of leaving during the Valley Fire. She told of smoke and darkness creeping over the community. They left their home for a hotel which was also evacuated. From there, they went to Lorraine’s sister’s home, which was also lost in the fire. When they were given the all clear to come back, there was nothing left. “We’re starting over at 67, but you’re never too old to start over,” said Lorraine. The second home dedicated belongs to Mary, Richy and Lorraine’s daughter, Dustin and their son Cameron. 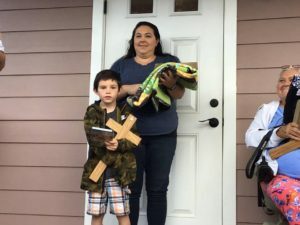 Cameron is a very shy 6-year-old, but was very excited to show everyone around his new house. “It’s a BIG house,” he said as he tried to hide behind his dad’s side. Cameron started the tours off with his bedroom and proudly showed off his Spider-man bed spread and his soccer trophy. Cameron showed off all the Batman decorations in his bathroom, and finished off everything with, “I’m HAP-py!” His parents let him stay home from school to celebrate the home dedication, and he even gave us a little interview about planting grass for his and his grandma’s house. These are such lovely families who we have been praying for continually as volunteers have worked on their homes. It’s days like today that bring glory to God for all that he provides. HCRN is simply the hands and feet going and doing the ground work, fulfilling the commandment to help the needy. And that’s where the efforts of all our volunteers shine through. Without their willingness to help people they’ve never met, none of this would be possible. Thank you to all our volunteers and congratulations to the families as they move into their new homes and start fresh.